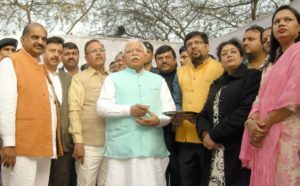 For effective waste management in Gurugram, foundation stones for 11 solid waste transfer stations were laid by the Chief Minister of Haryana Manohar Lal Khattar. The stations will serve as temporary waste centres where the waste collected from households will be kept till, it is transferred to Bandhwari for further processing. Residents will be required to segregate waste at source into two separate bins, categorised as dry and wet waste. Residents can check the arrival time of garbage vans through an app. “The entire state has been divided into 15 clusters for waste management and global tenders have been invited for each cluster. Gurgaon and Faridabad have been kept under one cluster. The project would be complete by February 2019,” said Khattar. The State has signed a Memorandum of Understanding (MoU) with Ecogreen Energy Private Ltd to develop Haryana’s first integrated solid waste management project. A similar project for Faridabad was also launched by the Chief Minister at the event.